"Because AGS entrances are fabricated from a wide variety of stiles, it is easy for you to customize your own door!" Depending on traffic requirements and desired aesthetics, these entrances can be manufactured in Narrow, Medium or Wide Stile rails. Our sturdy construction is perfect for high traffic areas. . This Signature entrance utilizes a unique blend of horizontal, vertical and angled rails which mirror the angles of the custom hardware. When you want distinctive entrances, AGS's custom color, sizes and detailing can help make your projects notable and profitable. Contrasting glazing beads which coordinate with custom hardware, and wide center panels, are just a few of the attributes which make this entrance special. Custom colors and finishes on the glazing beads and door can create subtile or outrageous two-tone effects. This his door can handle heavy traffic while maintaining a light, airy look. Custom brass hardware gives at a classy appearance which can be further enhanced by inserting beveled or etched glass. When a multi-lite stile of door is required, the perfect choice is the Signature Style D. We can design your entrance in a variety of colors with complimenting or contrasting glass beads. It can even be constructed with different lite patterns to meet your particular needs. Shown with our standard push/pull, the look of the Style D Entrance can be further enhanced with a variety of custom hardware. The look of vintage apartment buildings, theatres, boutiques and other storefronts can be easily achieved or maintained with the Signature Series Style E Door. The grids can be customized to meet your specifications and are constructed of welded, non-tubular members for the highest possible quality. Narrow, medium or wide stile rails are combined to give strength and style to AGS's Style F Signature Door. It's sturdy construction is perfect for high traffic areas and, as shown, it can be accented with custom hardware and contrasting glazing beads for a truly striking entry way.. Dramatic effects are easily achieved with AGS’s premium Style G door. The addition of various contrasting glazing beads and beveled glass create an elegant entrance. Like other AGS doors, you may create your own unique styles by changing the size and shape of the glass opening, by contrasting finishes on the door and glazing beads, or by the addition of custom push/pull hardware. The formidable appearance of the Style H door is achieved by the insertion of a heavy 10” section set into the door at its base and intermediate rail. 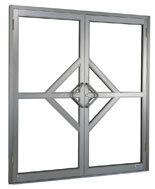 It is particularly well suited for heavy traffic areas where doors must be manufactured to withstand high impact. It is shown here with AGS’s optional mail slot and contrasting clear anodized glazing beads. It can be further customized with alternative hardware. When your entrance needs to express elegance, the Style I door, with its brass accents and medium as well as dark bronze finish, will do the job. The center area may be constructed with glass or panel inserts. Just as in the Decodoor, shown above, the “I” Style’s panel may carry a logo for immediate identification or it may carry an original artistic treatment. 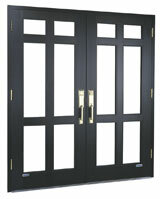 AGS’s Mid-Panel Decodoor is one of the most versatile doors available. It combines the beauty of a light open look with the construction features that enable the Mid-Panel Decodoor to handle light or heavy traffic under all weather conditions. The Decodoor is available with the panel installed in the center area as shown left, or it can be adapted to your individual use. The panel may carry a logo for immediate identification or it may carry an original artistic treatment which invites viewers to enter.